And that’s why they call me Grace. Just had to share a little incident with you all. An uplifting vignette from my week. So. There we were. We had to resort to a quick fix of some sort, and there weren’t really any options floating around in the cupboards. But, happily, the kids had all gotten their report cards from school that day, and a fun little perk is that they get gift certificates to Arby’s based on how many “A”s they get. We had a few of those to cash in, so we decided to do that for dinner. Off we all toddled to Arby’s. On the way there, my mother-in-law called and I was chatting with her on the phone as we walked in. Ben took the kids up to the counter to order, and I stood back a little to finish my conversation. 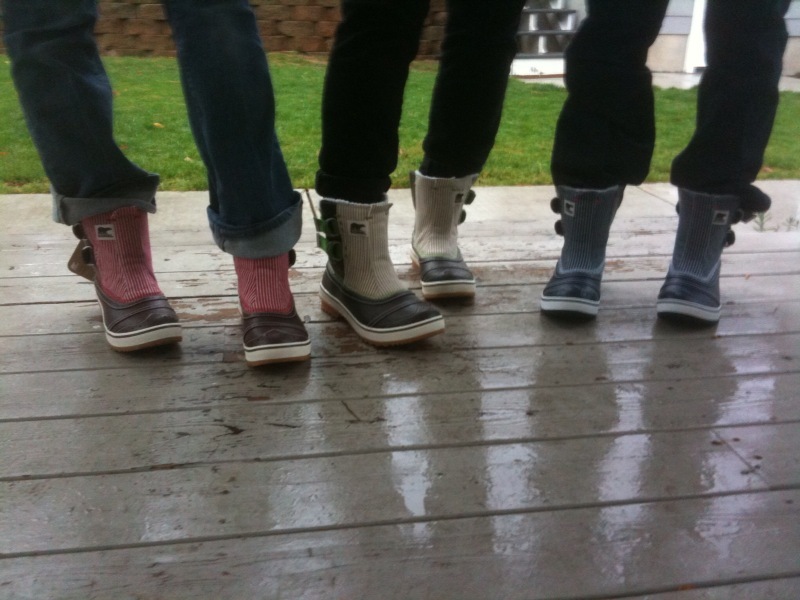 Interlude: I should have mentioned that we here in Idaho have heaps of snow and ice, and I was wearing my snow boots. Not ridiculous heels like I wear through the snow and ice every single day to teach, but actual, sensible, snow boots. Anyway, there I stood in Arby’s, innocently talking on the phone. Standing, mind you, on the tile floor in sensible shoes – not walking or moving or gesturing or hopping or anything of the sort. Just standing still. And suddenly, out of the clear blue, with no warning whatsoever, both my feet shot straight out from under me. To this moment I have absolutely no idea why . . . wet boots on a wet tile floor still seems like a totally insufficient cause for something like that. For a moment I hung there in the air, doing a wildly ineffective Scooby-Doo run . . . and then nature took its course and I wiped out utterly flat on my back. Indeed. I did that. One minute I was calm, cool, collected, and vertical, having a nice chat . . . the next minute I was nothing more than a pitiful and confused damp splat on the Arby’s floor. For reals. Not only did I do that, but I did that in the front of the restaurant with the entire staff standing there looking out at me while I did so. I am absolutely confident that they have already gotten the surveillance footage and put it up online somewhere. I’m probably already part of a medley called Fast Food Wipeouts set to an old Queen song. If any of you ever run across it, make sure you send me the link. Absence makes the heart grow fonder, indeed. Too funny! A double hit to your pride in one little evening. Oh, the undercooked meat thing happened to me this week too! I’ll have to admit that some tears were shed over a crockpot FULL of veggies and a roast that somehow were all still hard (veggies) and certainly not tender (meat). Thank you for the great laugh. I needed it. uncooked meat scenarios: had two families (new to the church) over for dinner…both I and my husband bragged about my cooking…the men ended up running to KFC for fried chicken! I was humbled to a puddle on the floor also! It’s a great laugh now! I’m so glad I wasn’t eating or drinking when I read that. I snortled. I laughed. A good time was had by all. First, I sympathize. I can trip over air. 🙂 Secondly, I am pleased to hear that I was not the only one to wear heels in snow. I feel they act as pitons. 🙂 Thanks for sharing Bekah! Ouch!! So sorry we all laughed. And so glad you didn’t hurt yourself. Oh thanks for the laughs! “a medley called Fast Food Wipeouts set to an old Queen song” Oh my, that’s good stuff. Thanks for sharing, Bekah. You are not alone–just last Friday I gave the neighbors quite a treat as I slid down our steep, icy driveway on my backside, loosing the garbage halfway down. Oh, Nancy, bless you for sharing! Winter is just full of wipeouts from the strangest places. Just so you know….it was Bekah who wiped out. I never would have thought of the Queen song medley, though I would wish I had. I didn’t want you to credit me with that brilliance!